Juan Downey’s notion of “invisible architecture” was central to his artistic exploration of the ecology of technology and mind within transdisciplinary environmental concerns. 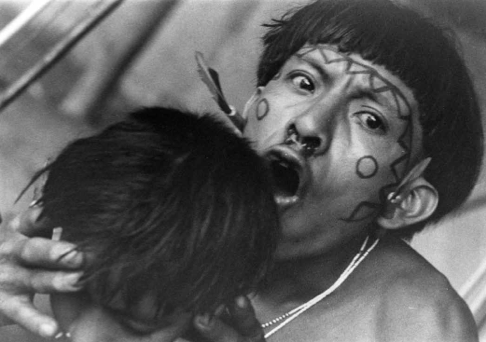 These ideas permeate his quasi-anthropological interdisciplinary and inter- and multimedia artwork Trans America, made whilst living with the Yanomami people for three years. Downey created real time video feedback between the Yanomami and televison monitors and the Yanomami saw themselves on television for the first time. These closed video circuits were contemporary with the very first artistic experiments with video feedback systems, along with Nam June Paik’s “Buddha” piece of 1974. As many artists were exploring the video telepathy and transference as described by Rosalind Krauss, via narcissism of placing the artist at the centre of the video, Downey was exploring telepathy of video via long-term immersive collaboration with others, replacing Krauss’ ‘narcissism model’ with a wider more anthropological model of ‘participant observation’. His invisible architecture was an exploration of “energy and the manipulation of this wave material”. He was greatly influenced by cybernetic thinking of 60s and early 70s counterculture as well as the then current ecological theories and philosophical ethics of Buckminister Fuller and Gregory Bateson, and his interest in cybernetics was interwoven with his interest in neurology. As a collaborator with Ant Farm and Douglas Davis, Downey and his milieu explored notions of cybernetic feedback, energy transformation and even telepathy. Downey was more interested in communication and information rather than technology in itself. His text Architecture, Video and Telepathy. A Communications Utopia clearly has strong affinities to Bateson’s concepts of ecology, adaption and flexibility used widely in the 60s and 70s and in counterculture magazines such as Radical Software. His ecological perspective is also apparent in works such as A Vegetal System of Communications for New York State, 1972. Like conceptual artist Robert Barry, who is arguably more well known for his work with telepathy and the energy and electromagnetism of the body, radio and everything, Downey also focuses on telepathy and electromagnetism in his invisible architecture aesthetics that Julieta Gonzalez shows is deeply wedded to ecological ethics of mind. Downey’s concepts of telepathy and architecture are allied closely to those discussed by Fuller in his introduction to Gene Youngblood’s book Expanded Cinema. http://charlotteskitchendiary.com/2012/03/04/using-up-the-pumpkin/  Daniel Quiles, Juan Downey, Artforum International, 50.1 (Sept. 2011): 350. He trained in architecture but practiced as an artist and worked with painting, drawing, writing, printmaking, and then interactive electronic sculptures, performances and happenings to explore the overlapping and interrelated systems of energy in the universe.